If you're looking for the latest sub-ohm tank to hit the market and want it at a highly competitive price, you're in luck with the all new Cleito Tank from Aspire. The Cleito Tank breaks down the wall of standard, introducing a new coil head, which boasts dual Clapton Kanthal coils, that completely replaces the standard chimney. This new design delivers increased airflow, thus allowing for even more vapor production. The Cleito is constructed of 304 stainless steel, it uses a Pyrex glass tube for its tank portion, and a wide bore delrin drip tip is included. The Cleito also uses cuffs to dissipate heat, as well as letting you customize the tank with different colors. Last, but certainly not the least from the Cleito Tank is its top fill design and 3.5ML tank capacity, which will allow you to easily refill your tank ensuring your convenience is top priority. 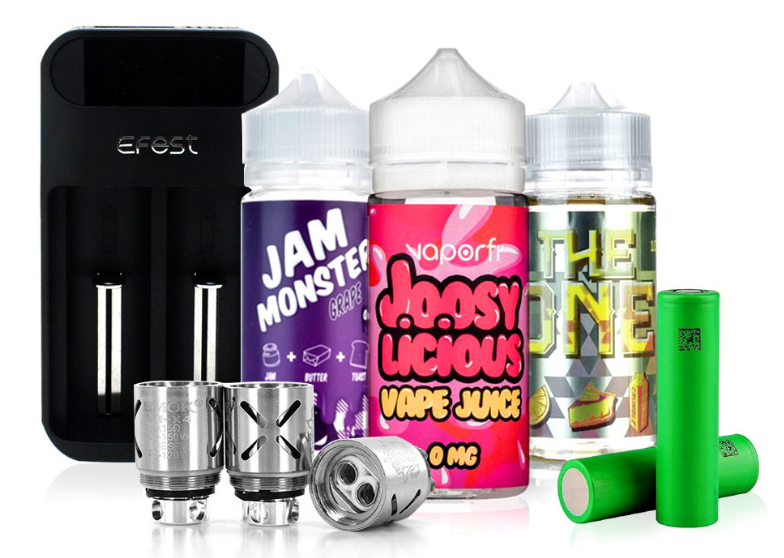 Buy the Aspire Cleito today! Great flavor, no leaks, big clouds! I hope this tank stays in production for a long time. I will always use the Cleito, the .4 coil is great between 40-55 watts. The flavor and vapor from this tank is 2nd to none. If you are looking for a tried and true tank, look no further. I have owned this tank for over a year now, and I have dropped it, kicked it, (accidentally) thrown this tank and it has never failed me or broken any glass. This tank has a .2 atomizer and a .4 atomizer. DO NOT USE THE .2 atomizer. It gets extremely hot, and flavor drops off a cliff. Use the .4 SS or .4 Kanthal coil. The three airflow slots and wide bore column atomizer makes the draw on this tank very enjoyable while throwing up huge clouds. I recommend this tank to any vaper, from Newbie to a seasoned builder. This tank will blow your mind. BUY IT NOW! I'm a newbie, puchased a Kanger topbox, dropped it and tank broke. I read some reviews on the Aspire Cleito tank and decided to purchase it. Although I was a little dissapointed that Direct Vapor shipped me the wrong color; I still decided to keep it and try it. This tank really performs according to all the reviews on it. Really a flavorful tank and the clouds are great! I just wish I would have received the correct color, but of course that has nothing to do with the quality of this item. I've been using this tank for about a month now. I love it and hate it in the same breath. I have tried the .2, .27 and the .4 coils and for me, the .27 is the best. The .2 has a lot of spit back and the .4 it feels like I'm inhaling a baseball. I got this with the K4 kit, hands done this battery is the greatest. For the price that I paid, $30 on sale, you can't beat it. I've had a few bad tand from aspire, like the Mini for example, but this tank really shed some light to Aspire. No spitting, except from a bad coil, and the pull is amazing. No doubt I'll be using this tank until I convince myself to try out Smok. Yes I dropped it but I've dropped my triton 1 many times and never had an issue ( I know it has metal support bands to prevent damage). So I cracked it when it was dropped. The reason I'm giving it a bad rating is because the replacement glass giving does not fit right. It does not fit snug. If i don't have the top threaded tight the replacement glass falls off along with all the juice I've put in it. Im ordering another cleito for the taste but I really wish they would work on the quality of manufacturing. I've also had issue with aspire coils. I get a pack of 5 and some only last a day while others last 4-7 days. I love this tank i have owned the same one for 6 months and never get tired of it. It blows bigger clouds than my rda. Make sure you get .4 resistance coils for higger cloudz. I was in need of a new tank and it got here pretty fast. But nevermind the shipping! This tank is so good for clouding. Personally I vape for flavor and boy does it taste great coming out of this tank. Coils need to be primed correctly. Glass is kind of tight but don't be afraid to really pull on it to get it out of there Okay? Comes with an extra coil and glass which is super convenient for anyone who is clumsy. Better than any tank I've ever had (kanger/crown) and the best part is; it doesn't cost that much. Highly recommend it for anyone that likes clouds and great flavor. I have this a 5 and I will definitely be telling my friends about how good this tank is!! This my 5th tank to buy and will be my last (for awhile). The clouds are thick and the taste is amazing. I haven't had any hot juice spit into my mouth, like I did with the Kanger. I use a Joytech mod box @ 40 watts. So happy I found this tank, now I am really starting to like vaping! I have tried about 10 other tanks and this is my all time favorite. I have had mine since they released it and not one to right reviews. To that point, this isn't a first week, tell you my first impressions. This is months later and I am here to say that this is amazing. The flavor is top along with the vapor production. I prefer the .4 ohm coil at 45 watts. The other coil isn't bad but I get an overall better vape from the .4 coil. No need for any other tank, don't waste your money, trust me, I have and still go back to the Cleito. This is my favorite aspire tank to date! My 1st subohm tank was the Nautilus. I had the Atlantis I & 2. My Triton still lives. I have 20+ tanks. While I chased after the next big thing to come along, Aspire smartly kept away from the huge coil trend and created the Cleito. Good move! I still like my TFV4's, but do regret the $100's I spent on the coils! The airflow from them is nothing compared to the Cleito. The flavor isn't as good either. Aspire freed-up that over crowded tank with their chimney style champ! They're probably laughing all the way to the bank! If I could sell my small fortune of $25 a pack coils, I'd be making a nice deposit as well! Sadly, I cannot. I have learned thou~bigger isn't always better! Aspire couldn't have done it better! This tank is awesome! Brings out the true flavor of the juice. I've used C-Cell coils in other tanks and I personally enjoy this tank and coils better. At least with my mods, mini volt and evic vtc mini. Top fill is super easy. Drip tip can be removed but it is a wide bore so if you use a different tip the original o-ring will be exposed. Tank comes apart for easy cleaning. Only con is you do need to drain juice if you replace coil mid use.... But really how often does that happen? Buy this tank!! I now own all colors! Flavor chasers dream sup ohm tank,.4 coils is where it's at. Just received my Cleito, this thing is great. Build quality is top notch. Easy to operate and clean, top fill is so much better than the old bottom fill. The new coils are much better than my previous tank (Atlantis) flavor is outstanding, clouds are great too. Flavor chasers take a look at this tank. I recently purchased the Aspire Cleito after reading about it online and wanted to give it a try. Having had the Aspire Atlantis in the past and had some leaking problems, I was hesitant at first to purchase the Cleito. But, I was amazed at the new design that Aspire came up with and how the clapton coil design really brings out the vapor and flavor. This is hands down one of best sub-ohm tanks for the money! Give it a try and I believe that you will be thoroughly satisfied. This tank is ideal for flavor, I am really pleased with how much flavor I get from it. I got the Cleito specifically because I had heard this and it totally performs. The standard delrin tip is very good. The one thing that could improve this tank would be if it had a bigger tank capacity. That would make it perfect!